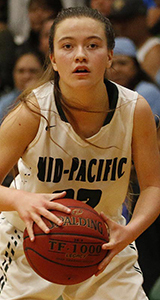 Player of the Year: Brilie Kovaloff, Mid-Pacific, G/F, So. 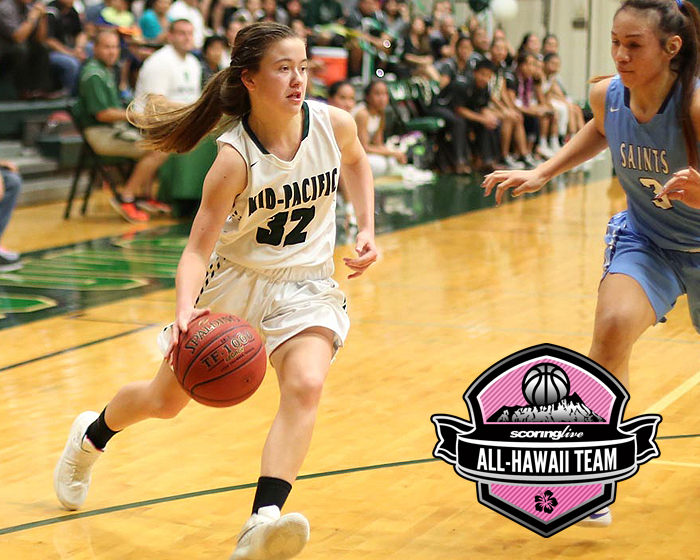 Brilie Kovaloff was calm, cool and collected for the Mid-Pacific girls basketball team. Kovaloff, a 5-foot-6 sophomore, impacted the championship-winning Owls in many ways and was chosen as ScoringLive's All-Hawaii Division II Player of the Year. 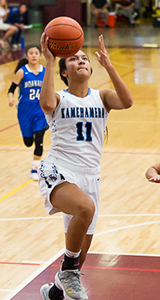 Like Hawaii Baptist's Ally Wada, last season's player of the year, Kovaloff stepped her game up to lead Mid-Pacific to its first state title in school history. "I seen her play for a couple of years when she was the intermediate level and you could tell that she was special. This year she really turned it on and it was neat to see her develop," said Damien coach Paul Tanaka. 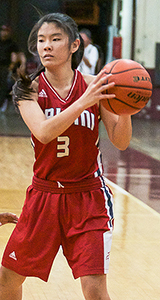 Kovaloff led the team in scoring at a modest 12.6 points per game, but she saved her best performances against top tier competition. The sophomore scored 21 points in a regular season win over defending state champion Hawaii Baptist, and scored 23 and 28 points on back-to-back nights to start state tourney play. "I was impressed with Brilie's command of her team," said Hawaii Baptist coach Keith Sugiura. "On the offensive end, she was able to establish Mid-Pacific's tempo and was so good in recognizing and setting up her teammates to their strengths. She made smart decisions with the ball, whether in transition or in half-court situations." When she wasn't scoring, Kovaloff was a menace on the defensive end, setting the tone for the Owls' airtight press and man defense. 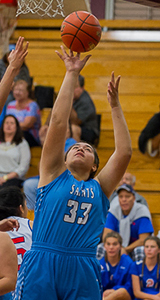 She also proved to be a valuable rebounder for an undersized Mid-Pacific team, gathering 11 boards against a Saint Francis team that had three players over 5-foot-10 during the regular season. "Defensively, I thought Brilie was one of the best on-ball defenders statewide in Division II," said Sugiura. "She's such a determined and tough player." Another thing that set Kovaloff apart from other young players was her poise. "I've never seen her rattled. She's terrific," said Tanaka. "It looks like it's almost effortless for her, she's really such a smooth player. There's no wasted motion wit her. She's strong in her layups and her shots, and she handles the ball and hardly ever turns it over. She's just one solid player." The Mid-Pacific girls basketball team was a cut above everyone else in Division II. The Owls went undefeated during the Interscholastic League of Honolulu Division II regular season and completely dominated the D2 state tournament en route to their first state crown in school history. Second-year coach Sherice Ajifu was the architect behind Mid-Pacific's success, implementing a faster style of play in the offseason while diligently preparing her team for each opponent it faced. "Coach Sherice is very deserving of being named the Division II Coach of the Year for the enthusiasm and confidence she brought back to her alma mater," said Hawaii Baptist coach Keith Sugiura. "She's been able to reestablish their identity as a team-oriented program that will out execute you on both sides of the floor. They play within their offensive and defensive systems and each player understands her role, they don't beat themselves." While Mid-Pacific went unbeaten during league play, it was far from perfect. With 16 days in between the final game of the regular season and their first game of the state tourney, the Owls fine-tuned their style of play for the final gauntlet. The amount of work the Owls put in was evident with their performance in the state tourney. Mid-Pacific began the tournament with a 82-30 win over Damien in the quarterfinals, which was followed by a 62-34 semifinal win over Kalani and a 25-point championship victory over KS-Hawaii. 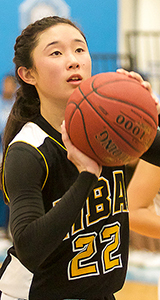 "She prepared them really well in the two weeks and she did an awesome job," said Damien coach Paul Tanaka. "They're not very big, but they mad everyone else look small and made everyone else look in slow motion."